Yeah, as to the update speed, it will probably go down a bit since I no longer have to juggle two timelines. That said, it'll still probably be about a mission a day, if only because I'm the sort of guy who tries to fill awkward silence with chatter. I'm still accepting proposals for the next challenge! You know what's interesting? Well, not Devlin, that's for sure, but the fact that his seemingly obvious statement is actually wrong. 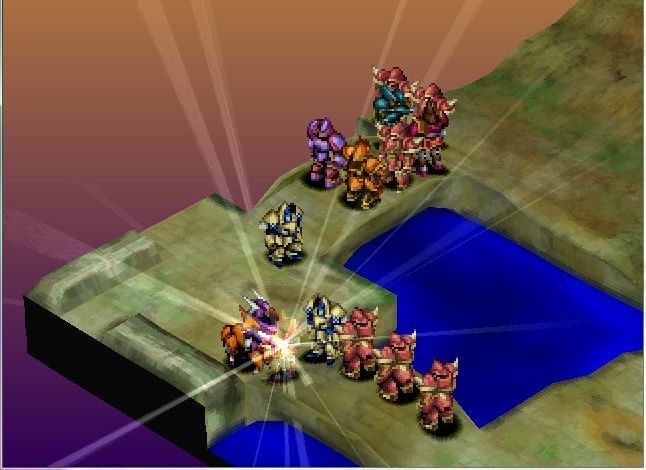 Due to the mechanics of Vanguard Bandits, being surrounded is actually pretty helpful. : I care not if they send one soldier or a thousand to attack! We will defeat them all! 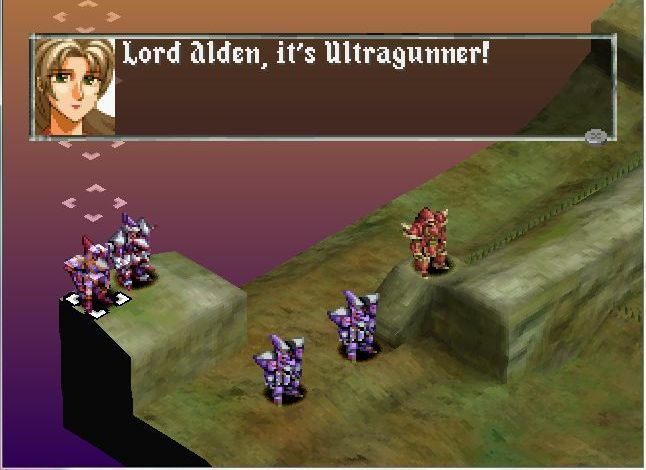 We will give His Highness all the time he needs to resurrect the power of the Ultragunner! Actually, that brings up an interesting question. Okay, so Reyna took a leave from the Avalon Army, and then ended up touring a temple in the Empire...while Avalon and the Empire were at war. How did that happen? : Did you hear Duke Zeira speaking of his difficult childhood, Bastion?! I...I was moved by his courage! I think Devlin develops an entirely new personality for every mission in this game....and I still hate them all. 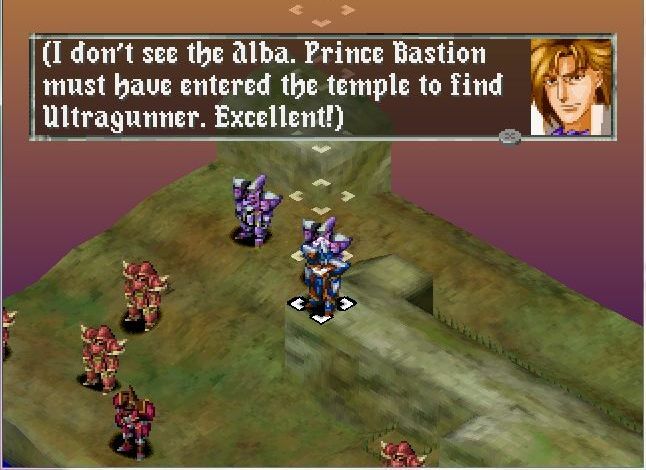 : Hey, Bastion, I bet they hid snacks in that temple along with Ultragunner! Bring me a few, okay? Barlow, on the other hand, is mind-numbingly consistent. : Be careful in that temple, Bastion...although it can't be more dangerous than Reyna's cooking. That joke doesn't even deserve the drum riff smiley. : Bastion, if you only believe one thing I ever say, let it be these three words: chicks dig sideburns. : Ah! I knew that foul scent rolling across the field was familiar. Your stench is unmistakable, Faulkner. : Childish taunts will not save your lives once my attack commences. Leave now if you wish to spare your lives. : Hrmph. I'm afraid you're seriously delusional if you think we're of the mind to accept such an offer. In fact, it is we who shall mete out judgment, pain, and suffering upon your sorry hides. : We will never let you gain possession of His Highness, or of Ultragunner! : Then we are at an impasse. One to be broken only by the flow of blood. Ultragunner shall be mine, make no mistake. If you are foolish enough to lay down your lives for a boy, so be it. Fools have died for less, I suppose! : We must hold fast at the bridges! They're the only thing between Faulkner and the temple! 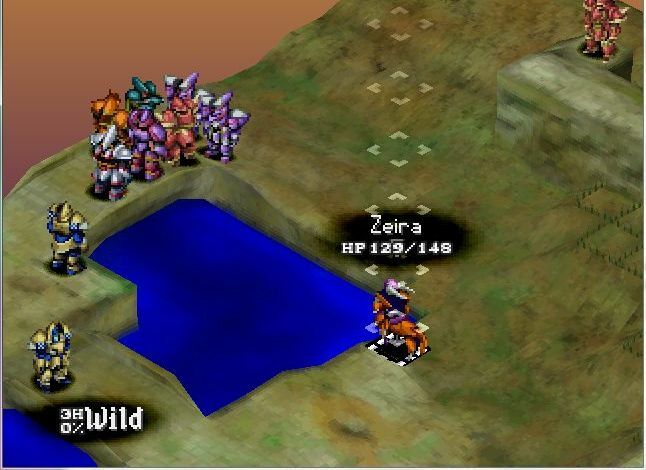 : Don't waste your breath on the obvious, Zeira!! : We'll hold the bridges and keep these parasites at bay for as long as Bastion needs! : This is our moment of truth! This is when the strength of our hearts will be revealed! It's possible to lose this mission by having Imperials reach the temple in much the same way that it's possible to drown in a two-inch deep lake. 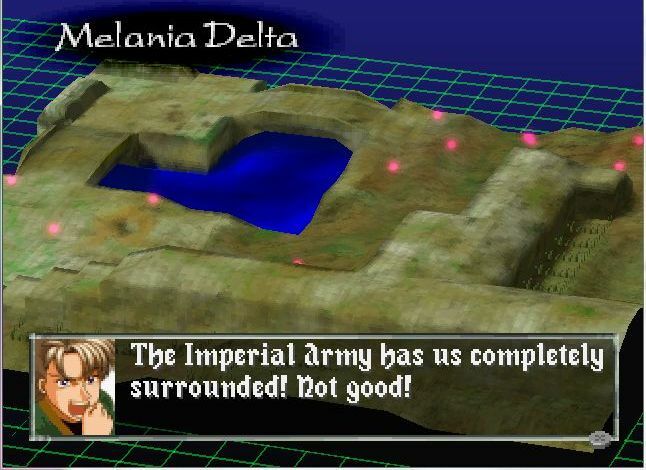 The Imperials aren't even going to head to the temple unless you deliberately move all of your units out of their attack range. That said, there are two bridges. Zeira is always going to go to the bridge on the right, and I usually send Barlow to help him, and keep in Galvas in reserve. Then, I send every one else to guard the bridge up top. The Imperials have a fair number of troops, but they break them into waves. Plus, the ATACs are the exact same types as in Chapter #3, and their pilots are so much better as to make them a threat. : Bastion -- And Ultragunner! : Your Highness! You look magnificent! : That is a sweet-looking ATAC! : Bastion, I can't lie. In that ATAC, you look almost as gallant as me! : It's about time you decided to show your face at the party, Bastion! : Ultragunner...the ATAC of legend! I can scarcely believe what I behold! 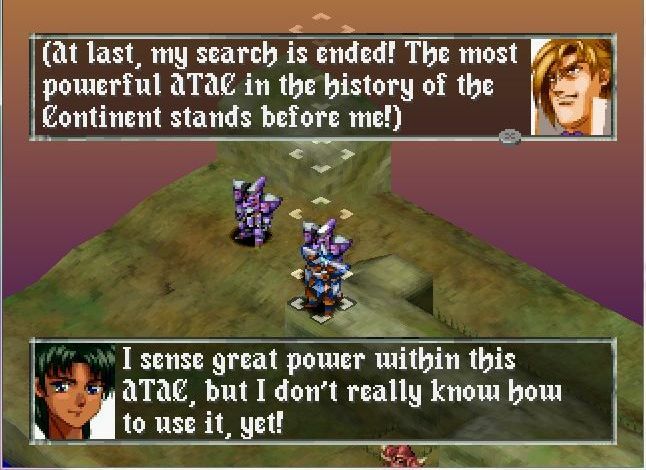 : I sense great power within this ATAC, but I don't really know how to use it, yet! : It's been ages since we first met, Prince Bastion. I apologize for not staying in touch. I must thank you and your friends for all your hard work. : What are you talking about? : You unselfishly found Ultragunner for me. I humbly accept your generous gift. : You're insane, Faulkner! I wouldn't give you a bucket of spit if you burst into flame! 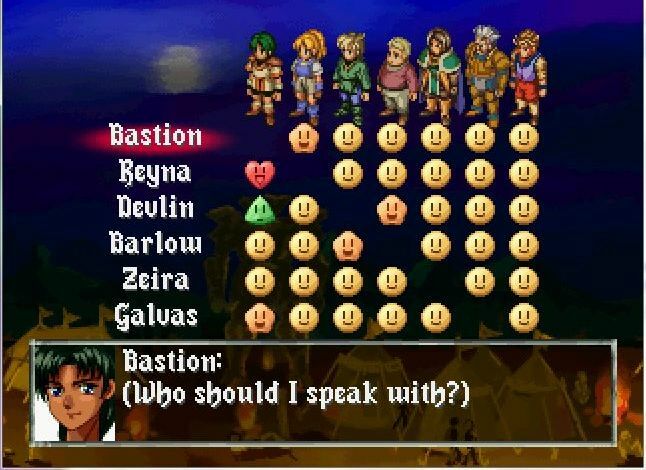 : Such a colorful insult, Bastion! But I assure you that I have an even better comeback. Bring her out! : Have you more harsh words for me, boy? Or will you play nicely? I would much prefer the latter. : No, Bastion! Don't give Ultragunner to him! You know the horror he would cause with it! Don't worry about me, Bastion! It was my fault for being captured. 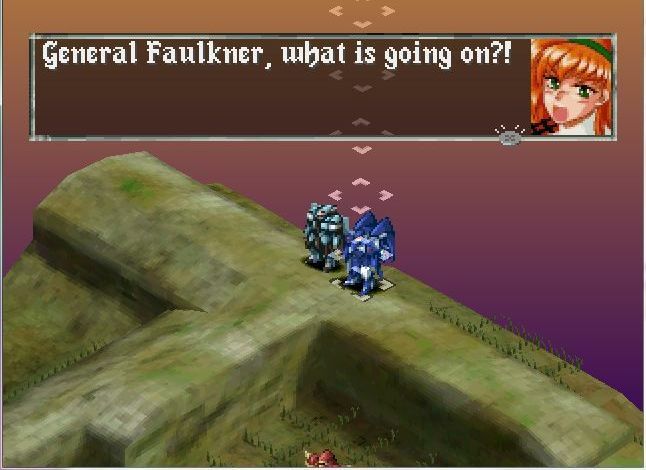 Do not give in to Faulkner! : It seems we have a martyr in our midst. How endearing. Well, child? Will you give me Ultragunner? : Mmmmm. The future King is having a difficult time reaching a decision. Perhaps I can be of assistance...I find time limits to be wonderfully motivational. You have to the count of five. : If I do not receive the answer I wish to hear, I will be forced to cut your friend neatly in two. I won't bother to describe what I'll do to her if you choose to attack me. : Don't do it, Bastion! Fight him! Don't give him Ultragunner!! : You have no heart, Faulkner! Neither heart nor soul! : I...I love you, Bastion! : Alright, Faulkner! If you want this damned ATAC, you can have it! : No...Don't be a fool, Bastion!! : Now, that wasn't so difficult, was it? It all comes easily once you are resigned to it. Step forth, then. Well, to summarize it for the Princess. The boy who has repeatedly claimed to want to annihilate the Empire has found a weapon of unparalleled power to allow him to do exactly that. So...uh...I would say that Faulkner is doing his damn job. : I cannot believe that you would stoop to such tactics as threatening the life of an innocent girl! You dishonor both yourself and the Imperial Army you serve! : I don't want to hear any excuses! I want you to obey my orders. 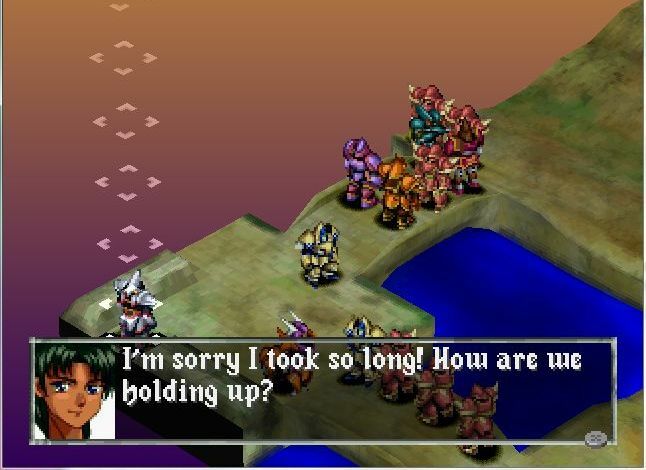 May I remind you it's your sworn oath?! Let her go! : Princess Sadira, you do not grasp the import of this, er, negotiation. : Obey my orders or I will have you arrested for conspiring to mutiny against the Junaris Empire! : Very well. Release the girl. : Do not thank me! Leave the battlefield before the hostilities resume! : Sadira, you saved Milea's life. Thank you. : I didn't save her for you, Bastion. I set her free because Faulkner's behavior was a stain on the honor and pride of the Imperial Army. Faulkner, I want you to know that this is far from over. You are supposed to set an example for your troops. Taking girls hostage is a poor example indeed! There will be a hearing upon your return to the capital. Disciplinary action will be taken, I assure you! Let's go, Franco. Man, even the ESRB is conspiring against poor Faulkner. : Well, Faulkner, it looks like you're forced to engage us in a fair fight. How unfortunate for you! Are you ready to be dismantled while your little grunts watch?! Faulkner will immediately come charging towards the northern bridge at this point. But, well, it's not enough. Why? : Indeed, Melior. The royal ATAC of legend has been resurrected at last. : It seems to be Lord Alden, ruler of Hibernia! : Hibernia? Haven't they taken a neutral position in the war between the Kingdom and the Empire? : Which means that if they're here, they must be choosing a side. I must say I don't think it's ours. : Lord Alden. What brings you here? Have you decided to join the Empire in its quest to unite the Continent? : I have come only to witness history before me, General Faulkner. As I have told you before, I have no intention of supporting the Empire or the Kingdom at this time. Please continue with your battle. : What do you think, Zeira? : Lord Alden is a man of his word, Bastion. He won't get involved in this fight now. 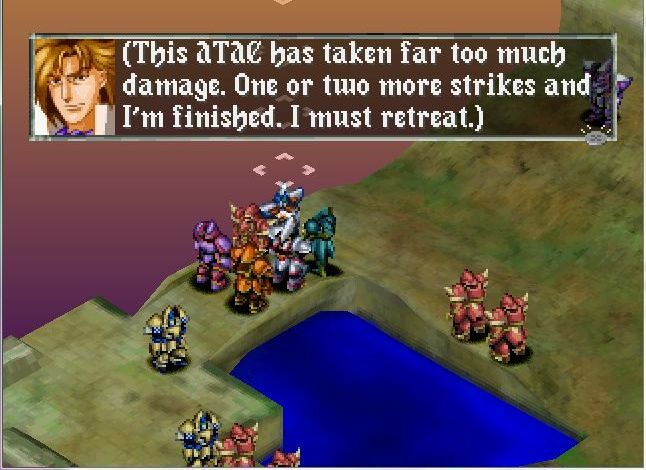 : Well, then, let's focus our energies on ending this battle quickly! Yep, Alden and Melior just kind of sit there and watch the battle. 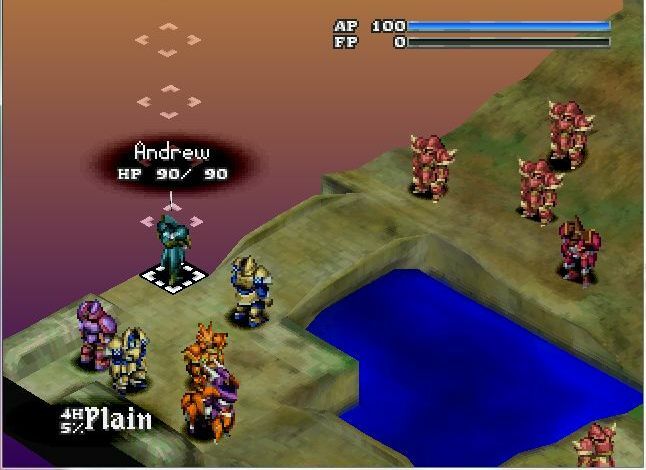 And I'm pretty sure that you can't attack them, as they're on a ridge which we have no way of climbing up. 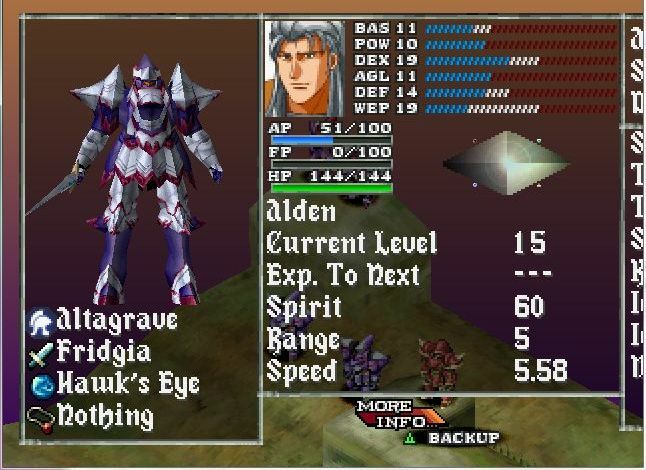 Here's a picture of Alden's ATAC, the Altagrave. Nice, if not spectacular. The problem of getting the Ultragunner before the half-way mark of the game is that you're never going to find a better unit for your army. Here's a list of Ultragunner's attacks. 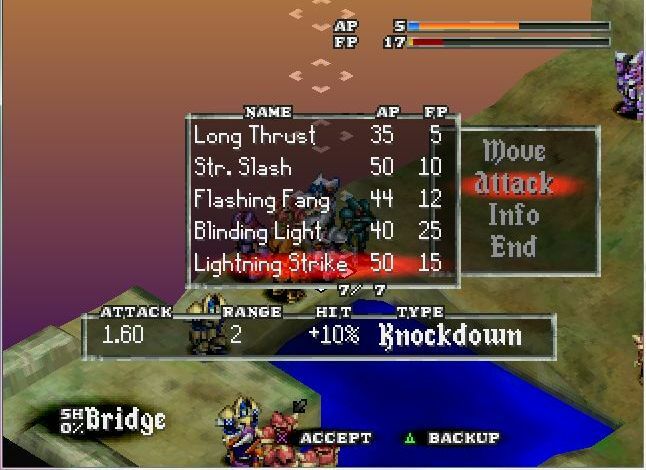 Look at that, 1.5 attack, +10% hit percentage, range 2, and it only costs 5 more FP than a Strong Slash? Bastion could kill everyone left on this map by himself. 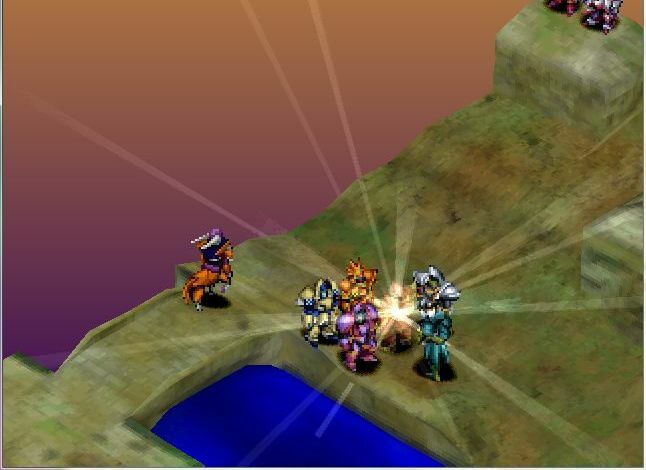 : I will remember this day, Bastion! And I will yet have Ultragunner! 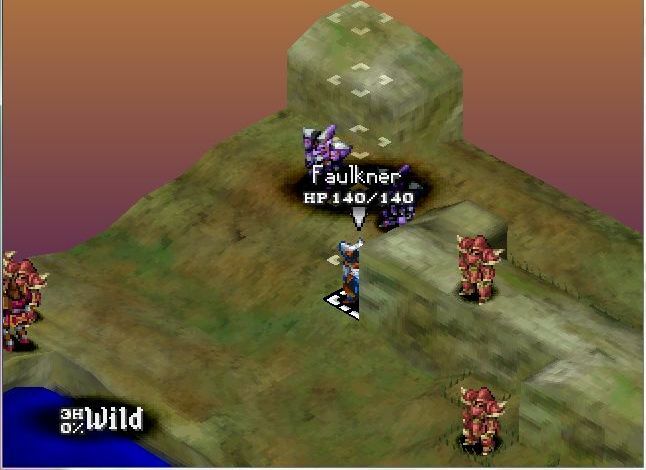 Faulkner flees at half-health. 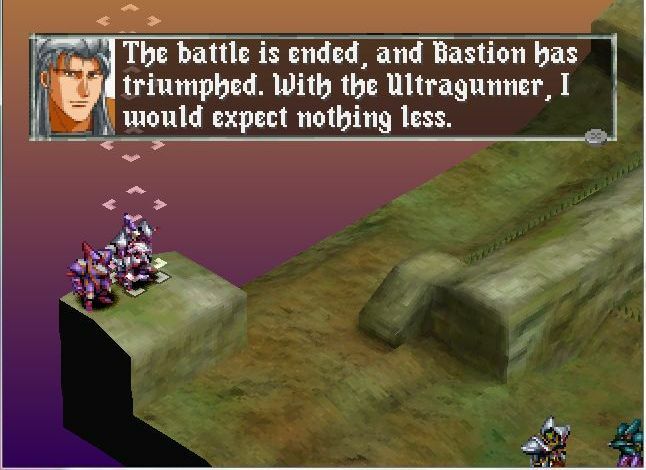 It is possible to kill him outright, but only Bastion is (probably) strong enough to do, and then, only if he's at a relatively high level. Anyway, the battle wasn't really in doubt even when Faulkner was alive, and it's even less so now. The only interesting thing to note is how the Empire ATACs are so staggered in their deployment schedule that you can still see one Imperial that still hasn't moved yet. : Lord Alden! 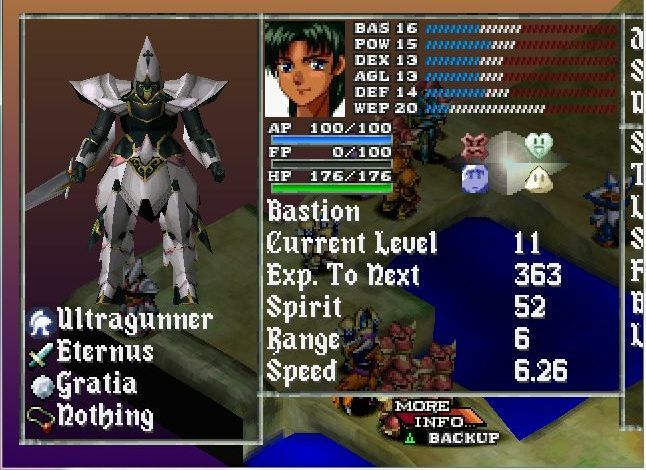 My desire is to use the power of the Ultragunner to restore peace to the Continent...Which means I must defeat Faulkner and the Empire. I ask for your cooperation, sir, and I ask you to ally with the Kingdom! : Your quest is a noble one, Bastion. But I cannot agree to an alliance at this time. I will, however, agree to consider your request. Come, Melior. : Yes, Lord Alden. Take care, Prince Bastion.